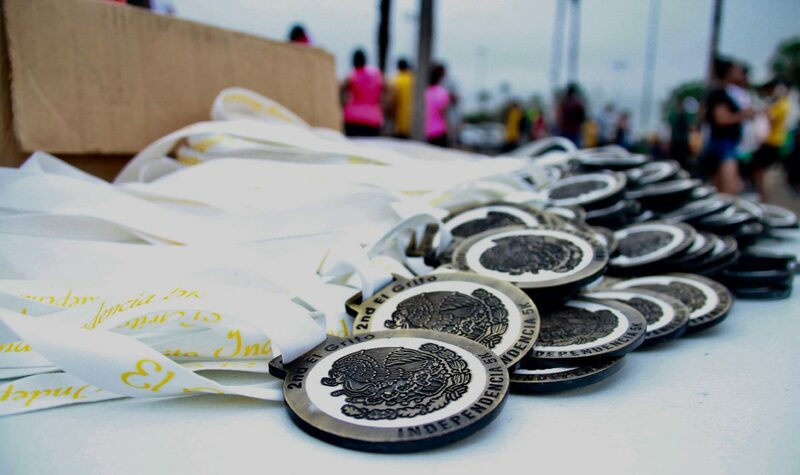 The medals for the 2nd annual El Grito de la Independencia 5k run at Pepsi Sports Park in Mission, on Sept. 15, 2018. Heavy rain scattered throughout the week didn’t stop Rio Grande Valley residents from taking part in time-honored traditions at Mexican Independence Day festivities this weekend. 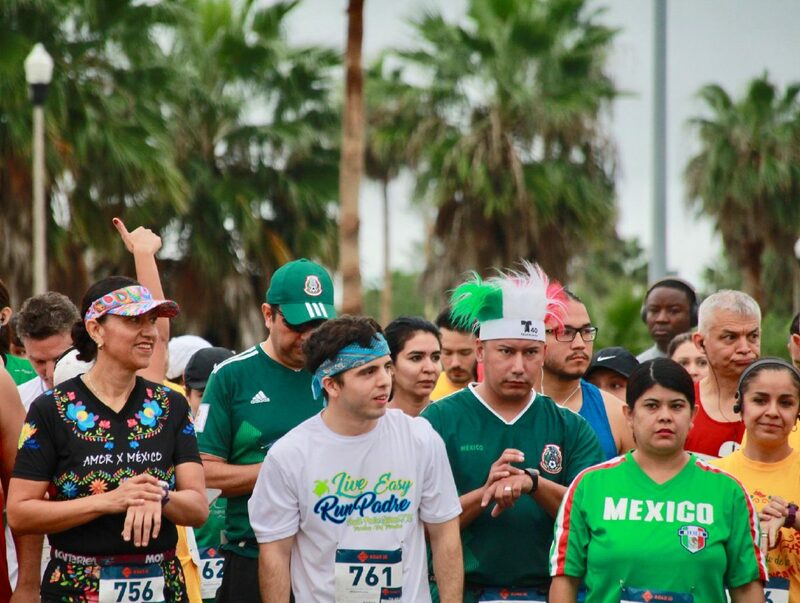 In Mission, more than 200 participants — clad in red, white and green attire — participated in the second annual El Grito de la Independencia 5k at Pepsi Sports Park. Per tradition, before starting the roughly 3-mile trek, about five participants took a microphone and performed their most powerful gritos. The Mexican interjection, which was formerly known as a battle cry, is now used to express joy or excitement, especially on days such as Sept. 16 — when Mexican independence is celebrated, including Sept. 15, the eve of Mexican Independence Day. Rodrigo Rodriguez, an army recruiter from McAllen, said his voice was a little too hoarse that morning to participate, otherwise he would’ve killed it. 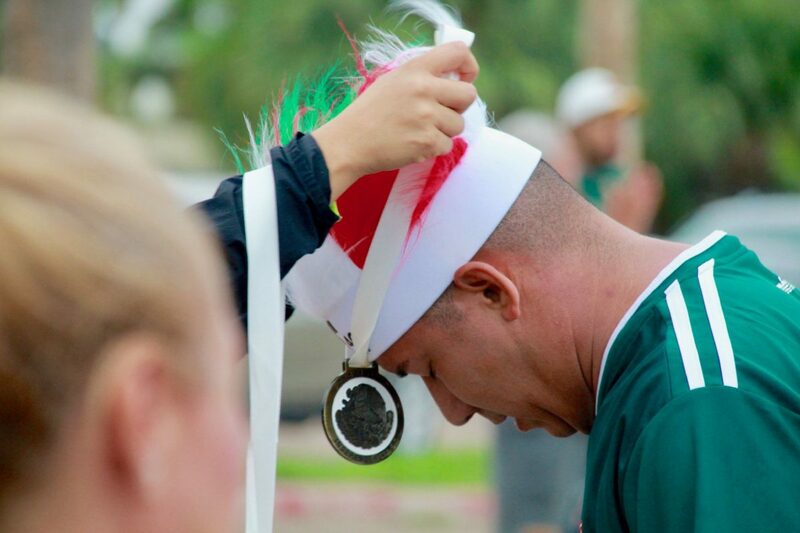 Rodrigo Rodriguez, 35, an army recruiter from McAllen, is given a medal at the 2nd annual El Grito de la Independencia 5k run at Pepsi Sports Park in Mission, on Sept. 15, 2018. 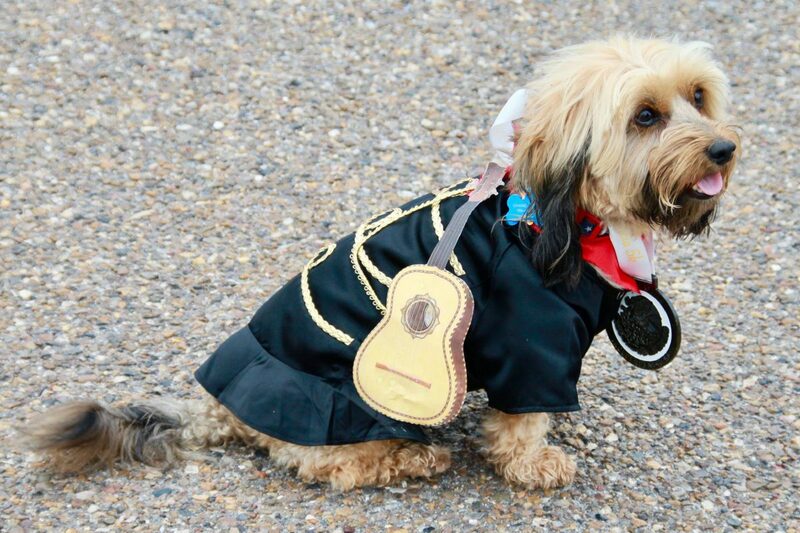 Bailey, a mixed breed dog from Raymondville, was awarded a medal for completing the 2nd annual El Grito de la Independencia 5k run at Pepsi Sports Park in Mission, on Sept. 15, 2018. Participants line up before the 2nd annual El Grito de la Independencia 5k run begins at Pepsi Sports Park in Mission, on Sept. 15, 2018. Rodriguez, 35, placed second in his age group. In the four years since he began running 5ks and he’s collected more than 55 medals, including the one he earned Saturday. Dolores Garcia, a participant from Roma, echoed that sentiment, adding that not even the flooded streets in her city stopped her from making it out to the run Saturday morning. Cristina Gueraca, a resident of Reynosa, spent her independence day on the U.S. side of the border. She placed first in her age group on Saturday — a title she’s held since last year, when she attended the same run. “I’m celebrating on both sides today,” she said in Spanish. Hector Gandara, owner of Endurance Splits, the organization who held the run, said they host more than 100 events a year. He said the running community in the Valley was well-represented at the event.